The discoveries of middle age and after are interesting. It’s the stuff of new life. 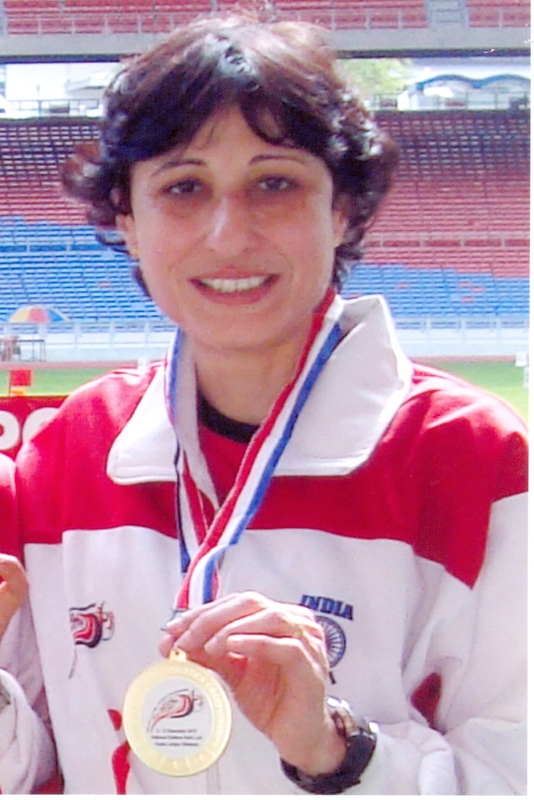 Khurshid Mistry was 44 years old when she commenced a serious pursuit of athletics. What she likes to do most is – sprint. 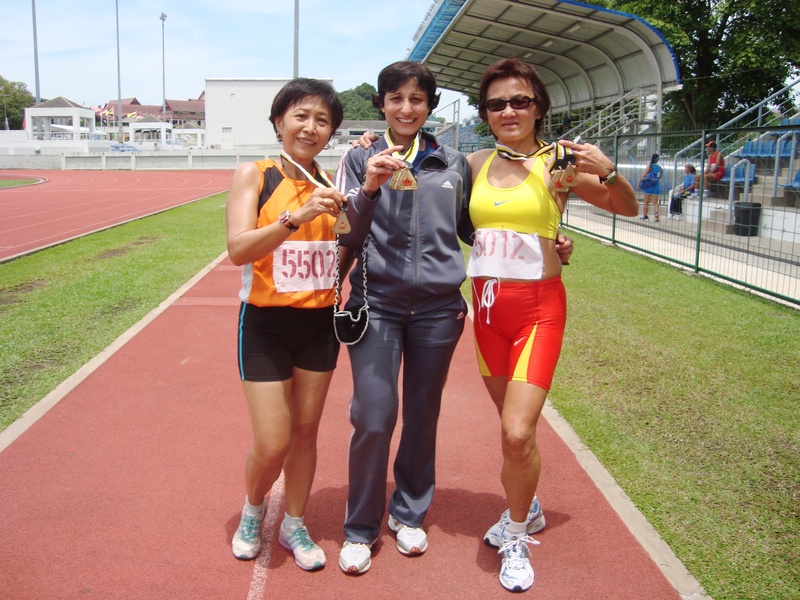 She has been a consistent participant and winner at Masters Athletics, where enrollment is restricted to people over 35 years of age. In Mumbai’s community of amateur runners, she stands out for the unique mix of events and training she does. The amateur running calendar in Mumbai is largely made of marathons, half marathons and 10 km-runs. The biggest event therein is the erstwhile Standard Chartered Mumbai Marathon (SCMM), now called Tata Mumbai Marathon (TMM) thanks to change of main sponsor. This is the event that got Mumbai running, gifting it over time, the country’s biggest amateur running community. TMM occurs every January. That’s when runners try to peak. Khurshid also runs at the event; she does the half marathon. Thereafter, while the local crowd drifts to a more relaxed schedule or attempts things closer to their heart, Khurshid commences training for the 100m and 200m. These are small distances compared to a 10 km-run or a half marathon. Except, these are distances that demand considerable training, particularly if you are the sort determined to excel. For the first half of every year, from just after the Mumbai marathon, Khurshid is completely focused on sprinting. In the second half of the year, she trains to run half marathons; the last of which signaling the switch back to sprinting, is the annual Mumbai marathon. Khurshid, a vice president at UTI Mutual Funds when we met her in August 2017, has been a podium finisher at all the half marathons (she had done 18-19 half marathons) and most of the sprint events she participated in. Born 1963 in Mumbai, Khurshid grew up in the city. She attended Queen Mary’s school at Grant Road, where her tryst with sports began. She was a regular at the inter school sports meet. “ I was really good in sports,’’ she said. Over time, she has indulged in running, swimming, cycling, horse riding and a variety of games. At Lala Lajpat Rai College near Mumbai’s Haji Ali, where she was next, her participation in sports continued although devoid of systematic training. By now studies had begun to matter. For the next more than 20 years, aside from aerobics and swimming to keep fit, she stayed off deliberate participation in any sports. 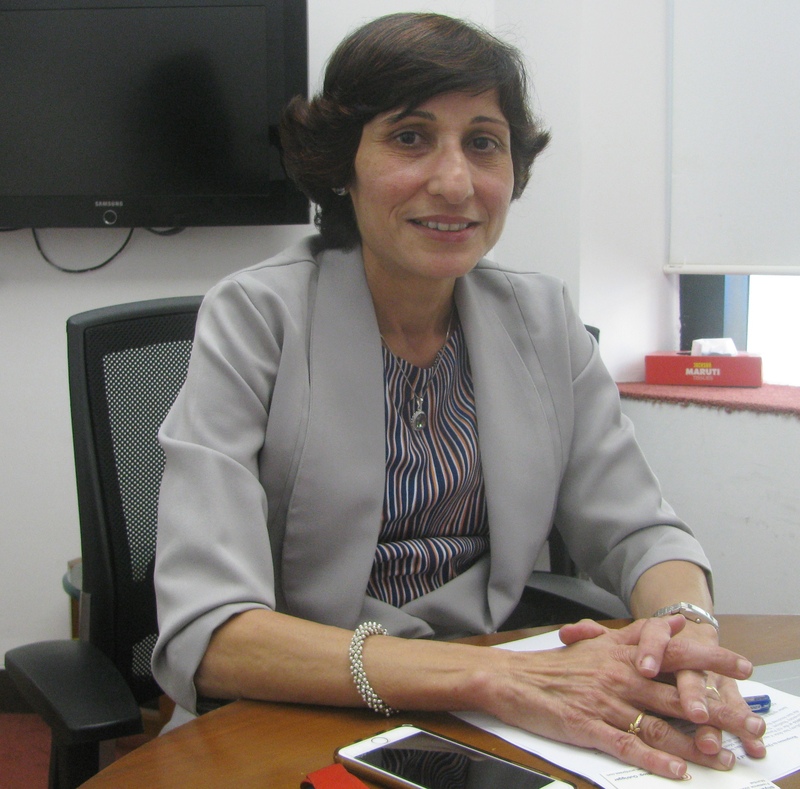 UTI Mutual Funds was her second job and once there, she stuck on. In 2007, UTI Mutual Funds decided to take part in the annual Mumbai marathon, scheduled for January 2008. In November 2007, those interested – Khurshid among them – commenced training under the watch of city based-running group Striders. In January, Khurshid completed her first half marathon comfortably. Praful Uchil, one of the founders of Striders, told Khurshid that she seemed the type who would do well in sprinting. “ At this age?’’ Khurshid asked. Praful assured her she would be able to do it. Soon after the Mumbai marathon, there was a corporate sports meet (it was called Corporate Olympics) which happened at Priyadarshini Park (PDP) in South Mumbai. A 20 acre-recreational complex with facility for sports, PDP has a synthetic track. 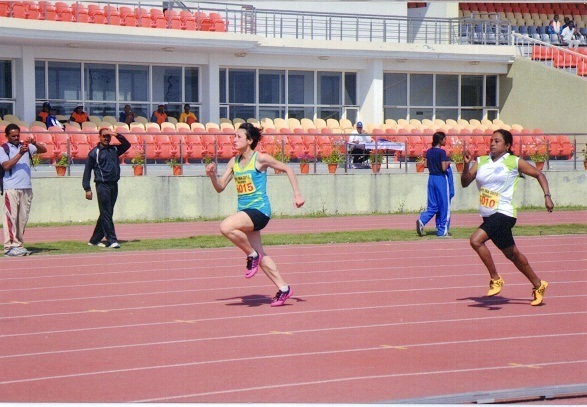 At the corporate sports meet, Khurshid took part in 100m, 200m, 400m and the long jump. She won in all four. It brought to focus the merit in what Praful had said earlier. Someone who likes excelling at what she does, Khurshid’s predicament required a road map. Two developments – the first one, three years before Khurshid was born; the other, when she was three years old – had set things rolling for what she could do bearing in mind Praful’s observation. There was a way ahead for middle aged sprinter. In 1960, Milkha Singh aka The Flying Sikh had finished fourth in the 400m final at the Rome Olympics. It has remained a high point in men’s athletics in India, ever since. For much of the twentieth century, general life in the world’s second most populous country stayed obsessed with making a career and earning a livelihood. Sport, athletics included, wasn’t a priority. A decade and a half into the twenty first century with India’s GDP among the top ten in the world, things are slightly different. Activities like running and cycling are catching on. Yet older people leading an active life, is still culturally new to India, where typically you live to support your family and then once you retire from work, you progressively fade. In Europe, Australia and New Zealand, as early as the 1930s, middle aged athletes used to participate with the younger lot in cross country races and road races. Some did well. Bunching together performance across wide disparity in age and then judging to find a winner is unfair. But the sporting spirit is such that an opportunity to run – even if it is a race – attracts. That’s probably what brought senior runners to these early races where people elder by age could participate. When Khurshid was three years old and yet a child in Mumbai, the push to get older people involved in athletics gained proper structure. In 1966, David Pain a civil lawyer based in San Diego, USA, started organizing ` Masters Miles’ at indoor and outdoor competitions with the minimum age for participation set at 40. According to Wikipedia, he and similar minded others soon launched the US National Masters Championship, where everyone 40 years and over competed together. The first such meet held in July 1968 at San Diego attracted 186 athletes. The second meet saw 200 people participate; it also introduced 10 year-age groups across all disciplines. Inspired by these meets, participants founded their own Masters meets elsewhere in US and Canada. A movement began, which acknowledged the athletic spirit resident in those middle aged and over. Two other trends contributed to the movement strengthening further. Colonel Kenneth H. Cooper was a doctor in the US Air Force. He introduced the concept of aerobics. In 1968, Cooper’s book aptly titled Aerobics was published. A few years later, its popular mass market version New Aerobics followed. Cooper’s writing helped fuel the American craze for running. As running became a craze, it became more inclusive, embracing the senior age groups as well. The second catalyst for Masters Athletics was a trend acquiring formal shape in New Zealand. Arthur Leslie Lydiard had represented New Zealand in the men’s marathon at the 1950 London Olympics, finishing thirteenth with a timing of 2 hours, 54 minutes. He became an athletics coach. Lydiard was a strong proponent of running for general health. At a time when the popular belief was that running is bad for one’s health, Lydiard encouraged easy distance running emphasizing its cardiovascular benefits. The word for it was ` jogging’ and its etymological origin appears wrapped up in other ideas for one of the early sentences Wikipedia cites is from William Shakespeare’s comedy Taming of the Shrew (authored between 1590 and 1592), wherein he wrote: you may be jogging while your boots are green. At that time, the word apparently meant: to leave. Whatever, Lydiard is credited with starting the Auckland Joggers Club. Among those, who in the 1960s got to run with Lydiard’s joggers was Bill Bowerman, American track and field coach and co-founder of Nike, the well-known footwear brand. According to Wikipedia, Lydiard organized for Bowerman to go jogging with one of his club members, Andy Stedman, who had survived three heart attacks. Bowerman, who was in his fifties, struggled to keep pace with his companion, who was 20 years his senior. On his return to the US, Bowerman took jogging to Hayward Field – one of the world’s best known track and field stadiums, in Eugene, Oregon – and eventually to the masses. So goes the story. All this – the senior runners of the 1930s, David Pain, Colonel Cooper’s books, jogging and Lydiard and Bowerman’s initiatives – dovetailed into sustaining Masters Athletics. The first World Masters Championship was held in August 1975 in Toronto, Canada. Two years later, in 1977, the World Association of Veteran Athletes was formed. It later changed its name to World Masters Athletics. In 1978, when Khurshid was 15 years old, India took the first major step towards recognizing the athletic ability of its older people by setting up the All India Veteran Athletic Association. The first national meet of this association was held in Chandigarh to lukewarm response. Things improved considerably over the next two years. In the following years, the word ` veteran’ got replaced with `masters.’ Today the Masters Athletics Federation of India (MAFI) is affiliated to the larger World Masters organization. MAFI’s website credits the genesis of the Indian push to include older citizens in athletics, to Milkha Singh. According to Praful Uchil, in late 2007 when employees from UTI Mutual Funds were training with Striders for the 2008 Mumbai marathon, he had occasion to run with Khurshid and observe her style closely. “ You can make out from a person’s running style, stride length and the extent of high knee action whether they will do well in sprinting or distance running. Khurshid’s style indicated ability to sprint,’’ Praful said. It is not unusual to come across such middle aged people. “ They may be among those natural sprinters who stayed undiscovered when young and still retain the style,’’ Praful explained. In his career as coach, he has encountered other similar cases in Mumbai. Encouraged by Praful’s observation, following the corporate sports meet at PDP, Khurshid trained and took part in the national meet for Masters Athletics. She topped the sprint disciplines she enrolled for, there as well. Then she hit her first stumbling block. 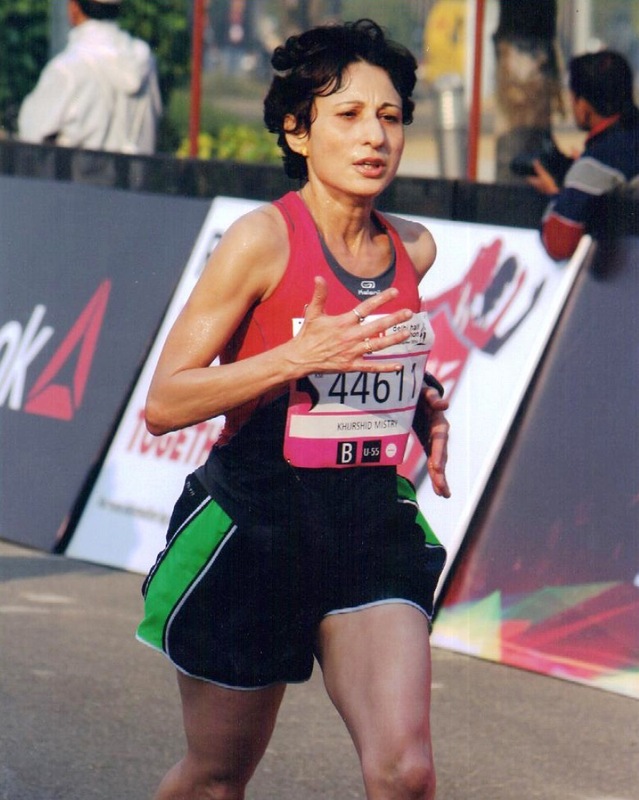 Given she had recommenced her running after 20 years with a half marathon and Mumbai’s amateur running scene revolves around its annual marathon, she decided to train for the following year’s half marathon. She was plagued by injury. “ Training to sprint and training to run a half marathon – they don’t blend,’’ she said. She realized that she required making a choice. 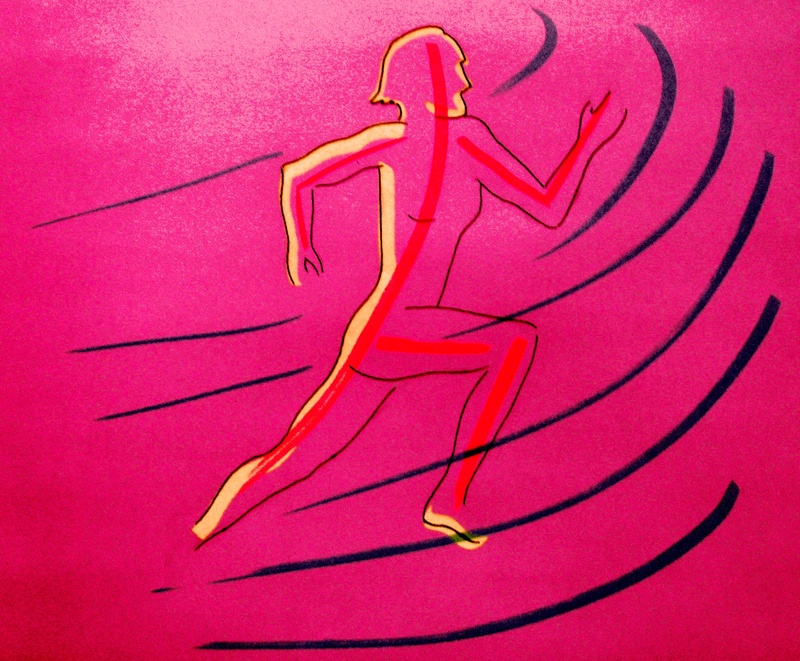 She gave up plans for the half marathon and decided to focus on sprinting. It was so until 2012, when she slowly made her way back to the half marathon, training carefully and systematically for it. In the process, Khurshid is in now among few runners of her age in the city, doing both sprint and distance running. 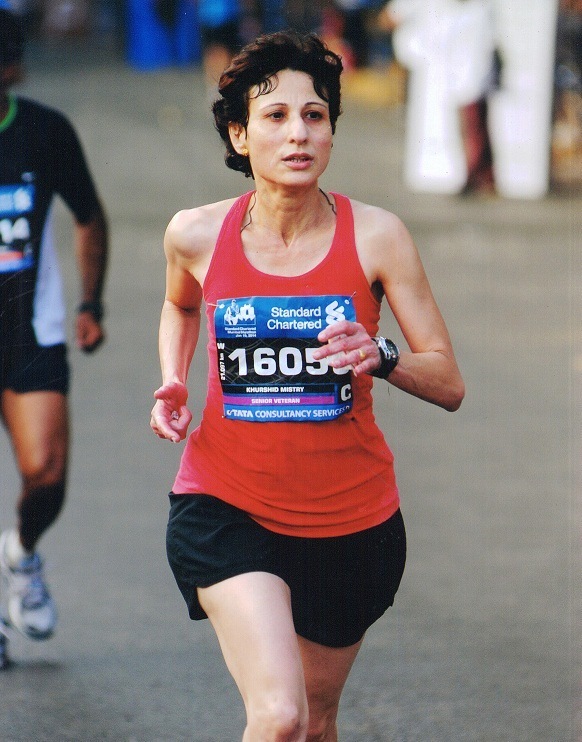 The 2013 Mumbai marathon was her first half marathon as an individual participant. She would go on to run all the editions of the event since then till now (August 2017), restricting her participation to the half marathon. She has also run half marathons at other locations like Delhi, Bengaluru, Goa, Amaravati, Vasai and Satara. Training to sprint is an intense affair. But sprinting comes naturally to Khurshid; it does not weigh her down. Her sprint training is done at PDP on the synthetic track there. Her coach at PDP is Deenanath Maurya. Every morning she leaves home for PDP, trains there, returns home, heads to office, works out at the office gym after work and then goes back home. That’s her schedule, six days a week. She trains twice a day; running in the morning, strength training and core workout by evening. In the eight years since she returned to running with that 2008 Mumbai marathon, she has had five stress fractures on the foot plus one hamstring tear. When injury strikes, she gives up running completely. “ A stress fracture usually takes six weeks to heal,’’ she said. But the trick she needs to master every year is the transition from sprint to distance running. After the Mumbai marathon, when Khurshid starts her training for sprint disciplines, it doesn’t take long for her to regain her comfort with running fast. What she struggles with is the switch to distance running from sprinting in the second half of every year. “ When I come off a sprint season and head into half marathons, my capacity for endurance is zero. Every year I have to start from scratch. It takes me at least three months to get my endurance back,’’ she said, describing her unique predicament in a city where most people are into distance running and measuring their daily training runs by the kilometer. 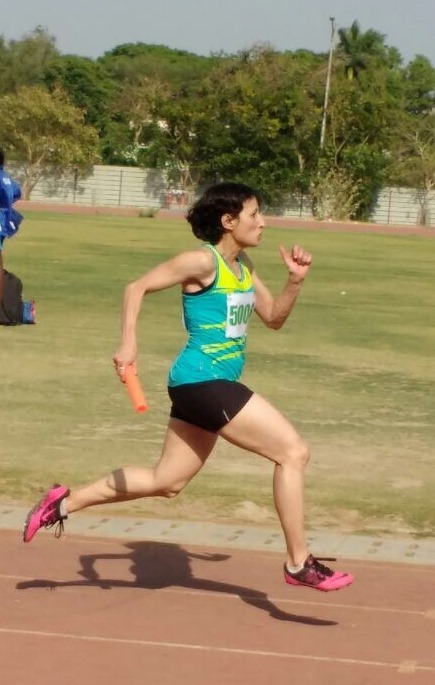 In contrast, every morning for the first six months of the year, Khurshid is on a 400m synthetic track at PDP, typically running shorter bursts given she competes in the 100m, 200m and 400m disciplines at Masters. What makes the transition particularly challenging is that in the switch from sprint to half marathon, the time Khurshid needs to regain her endurance robs her of the ability to fully utilize the events of the marathon season. This would be simple enough if your goal is to be recreational runner; run for fun overlooking performance. It is tough when you are determined to do well. Both adequate time for training, and ramping up with enough patience to avoid injury, matter. “ It is a difficult thing to do – straddling both sprint and distance running,’’ Praful said. Khurshid does not hide her desire to do well. Probably realizing what she is up against in terms of risk of injury, she does not run at every event showing up on the horizon. She picks and chooses. “ Everything in training depends on what is the competition I am gearing up for. I don’t do many events,’’ Khurshid said. In sprint season – which she finds easier to handle – she usually moves through the state, national and international level of competitions under Masters Athletics. In marathon season, it is typically not more than one half marathon a month with occasional departures to two half marathons. Ever since she started going for Masters, she has been a podium finisher in her age category all the way up to the Asian championships. 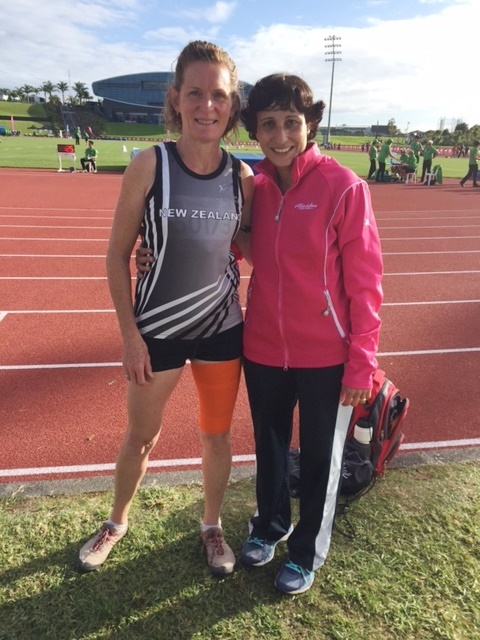 In April 2017, she achieved a longstanding dream – she participated in the World Masters Games in Auckland, New Zealand. She qualified for the final in the 100m and 200m sprint disciplines but couldn’t secure a podium finish in the final. She finished fifth in 100m and sixth in 200m. Khurshid is very happy that she could participate in the world championship. That had been a goal in her Masters Athletics journey. Since 2008, Khurshid has won gold medals in 100m, 200m, 400m, 4 x 100m relay and 4 x 400m relay at seven state level and seven national level Masters Athletics meets. Additionally, she secured one gold medal at the Asian Masters Athletics meet held in Malaysia, five gold medals at the international meet in Brunei and one gold medal and two silver medals at the international meet in Johar, Malaysia. “ Khurshid is primarily a sprinter. But she manages to run half marathons very well. The training for each of these is difficult. She does the training with much dedication. Very few people can do that,’’ Pervin Batliwala, among the best known senior marathoners in Mumbai said. Between sprint and endurance, Khurshid wants to focus on the former till she feels it is no longer reasonable to continue. We use the word `reasonable’ because in her case, giving what she is doing, her best shot, matters. “ Till I can do sprinting, I will keep doing it. Endurance can be pursued at any age. Sprinting is my forte. Why shouldn’t I do what is my forte for as long as I am capable of doing it well?’’ she asked. Besides, she confesses to being a bit impatient in wanting to see the outcome of a race she started. With sprint events, the result is available soon. “ I sometimes find the half marathon never ending,’’ she said. For now therefore, there is no thinking of the full marathon. If Khurshid is to do it, then, she will need to train well, train with focus; train for at least one year. “ I am a perfectionist. I do only things I am good at. Otherwise, I don’t do it at all,’’ she said. If she shifts to the full marathon in lieu of the half right now, the problem is – that will reduce her overall speed and compromise her ability in sprinting. She does not want that. She takes injuries in her stride, rationalizing, “ with time, I have learnt to take care of them.’’ As for her drive to sustain the current mix of sprinting and half marathon and excel at it, she attributed that to her innate character. “ I used to tell my father that I want to achieve something in life,’’ she said.